Parent birds are the parents of broiler chickens, birds who are raised for their flesh. The fertilized eggs of the broiler breeding parent birds are removed daily from the shed and put into incubators for hatching. They never see their offspring who are whisked away once hatched to be ‘grown’ in huge industrial broiler production sheds for 6-8 weeks. The floor in this shed was appalling, with over twelve months of compacted and hardened feces built up into ridges and valleys like a barren moonscape. The air was filled with dirt and feather dust and the smell was overwhelming. We found dead bodies rotting inside the shed and fresh feces smeared on some of the birds. They have been inside this shed for a year and are very debilitated and exhausted and will soon all be killed and processed for blood and bone, stock cubes or pet food. . Animal Liberation Victoria's (ALV) Openrescue team, headed by members of our newly launched Animal Liberation Youth group (ALY) inspected the broiler breeding parent factory farm near Melbourne for the third time on October 4, 2007. We rescued a further ten ill and debilitated birds, nine hens and one rooster. 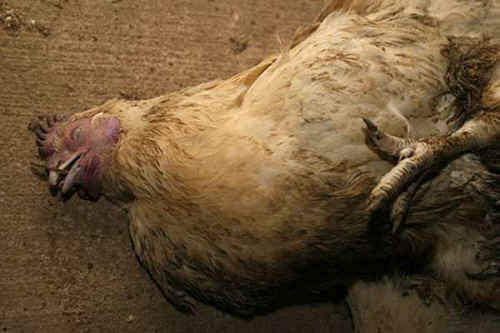 Two of the hens were euthanized by the vet due to their crippling and poor condition. The rooster was in chronic pain and put on antibiotics and we have to soak his feet daily to loosen and remove the rock hard feaces which are compacted and embedded in the flesh on both his feet. Both his claws were swollen, red and infected. There were thousands of hens and roosters inside this putrid shed, most of the hens had red raw backs and underbellies with feathers missing from their backs and from around the back of their heads. Roosters often hold on to the back of the hen’s neck with their beaks when mating. The floor in this shed was appalling, with over twelve months of compacted and hardened feces built up into ridges and valleys like a barren moonscape. The air was filled with dirt and feather dust and the smell was overwhelming. We found dead bodies rotting inside the shed and fresh feces smeared on some of the birds. They have been inside this shed for a year and are very debilitated and exhausted and will soon all be killed and processed for blood and bone, stock cubes or pet food. These birds are the parent birds of broiler chickens, birds who are raised for their flesh. The fertilized eggs of the broiler breeding parent birds are removed daily from the shed and put into incubators for hatching. They never see their offspring who are whisked away once hatched to be ‘grown’ in huge industrial broiler production sheds for 6-8 weeks. The chicks are ‘harvested’ after 8 weeks when they are already the size of adult chickens but still babies with blue eyes and chirping. Many are too weak to hold the abnormal weight gain promoted by selective breeding and routine antibiotics in their feed which acts as a growth promotant. The parent birds (those pictured in our slide presentation) are only fed every other day to prohibit high weight gains so they are still able to breed. They are continually hungry, frustrated, abused and suffering. You can help stop this. Adopt a vegan lifestyle and never buy chicken meat again, and encourage all your family and friends to do the same.